The Den-Con RH Series Roller Kelly Bushing is designed for heavy duty drilling operations, high torque and high speed drilling conditions. DEN-CON 27 RPH Kelly Bushing is used with Den-Con Pin Drive Master-Casing Bushings for 23" through 49 1/2" Rotary Tables. The 27 RPH has 3 5/16 " diameter drive pins (API) and 25 3/4" pin centers (API) and will handle Kelly sizes 3" to 6" square and 3" to 6" hex. DEN-CON 20 RPH Kelly Bushing is used with Den-Con Pin Drive Master Casing Bushings for 20 1/2" to 22 1/2" Rotary Tables. 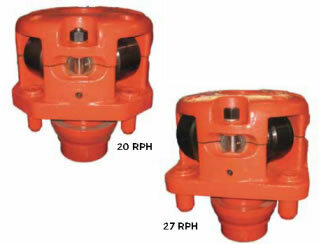 The 20 RPH has 2 1/2" diameter drive pins (API) and 23" pin centers (API). 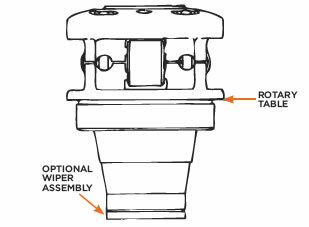 The 20 RPH uses the same roller assemblies, components and wiper assemblies as the 27 RPH. DEN-CON RSH Kelly Bushing is a square drive unit used with DEN-CON SSB Master Bushings and all Master Bushings having a drive square dimension of 13 9/16" (API). 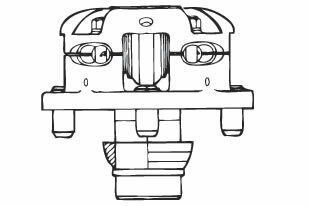 This bushing uses the same roller assemblies, components and wiper assemblies as the 27 RPH. All RH Series Parts & Components Interchange with Varco HD Series Bushing Parts. w/ wrench, less wiper assy. Fits Pin Drive Master Bushing 23” - 49 1/2” w/ wrench, less wiper assy. Fits Pin Drive Master Bushing 20 1/2” - 22 1/2” w/ wrench, less wiper assy. 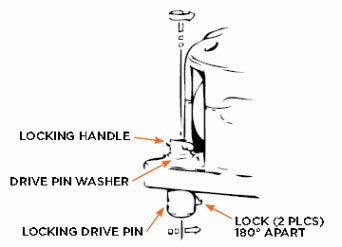 The Optional Lock Assembly locks the Kelly Bushing in the Master Bushing for use offshore with motion compensators. Lock assemblies are available for the 27 RPH series bushings. To order with an assembly, add “L” to the part number of the unit. DEN-CON RSM Kelly Bushing is a medium duty square drive bushing used with DEN-CON SSB Master Bushings and all Master Bushings having a drive square dimension of 13 9/16 ” (API). 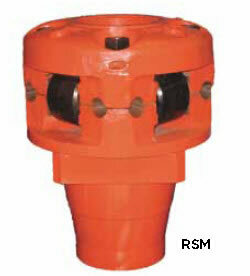 The RSM will handle Kelly sizes from 2 1/2” to 5 1/4” square and 3” to 4 1/4” hex. DEN-CON RPM Kelly Bushing is a medium duty pin drive bushing to fit 17 1/2” Master Bushings. RPM is made to order. RPM COMPLETE RSM COMPLETE ROLLER ASSY. w/ wrench, less wiper. Fits 17 1/2” Pin Drive Master Bushing w/ wrench, less wiper assy. Self-locking straight roller pins - prevents pin rotation and movement. Heavy duty graphite fiber bearing - prevents rusting, corrosion and galling of bearing structure. Stabbing skirt - allows fast and easy stabbing into master bushing assembly. Fast installation on Kelly - no shims required. Longer roller life - Roller assemblies may be turned 180° to double wear life to the assembly. Low maintenance - all parts field replaceable. Meets all API dimensions and specifications. 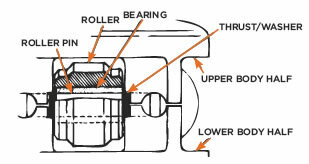 Sealed Bearing Assembly - provided on RH Series. Optional Heavy Duty Roller bearings are available. Den-Con manufactures replacement parts for Varco 4KRP, 4KRS and 4KRBM bushings which have been discontinued. Parts are also available for Varco MD Series bushings.